Native American and Indian Territories Historic Map Collection on CD - This CD contains 76 rare antique maps of Indian Related Maps. 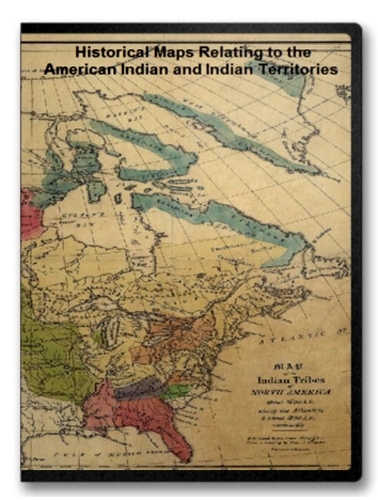 Includes Oklahoma and Indian Territory in 1905, Indian Reservations west of the Mississippi River in 1923, 1884 map of Former territorial limits of the Cherokee Nation Indians, Map of the Indian tribes of North America, Ardmore Indian Territory in 1891, Discovering the legacy of Lewis and Clark, and dozens more. Maps are in MrSid format, which allows you to see the entire map on your computer screen or drill down to see the smallest details. The original maps are often quite large, as much as 36" wide or larger and quite detailed. With the MrSID software, you can manipulate the map to print the entire map in great detail or zoom into a portion of the map in full detail for viewing or printing. MrSID software is included on the CD. This is a must have collection for any map history buff! To use this software, you must install the free ExpressView MrSid software which is included on the CD. This is a 30 second process and will allow you to view and manipulate/print all the maps in this CD collection in full detail. There is viewing software on the disk. It only runs on Windows platforms and full installation instructions are included on the CD.